Hi, I'm Martin Woolnough. And a warm welcome to my website. Yes, that's me above, on a recent holiday with my partner, Linda, to Majorca. 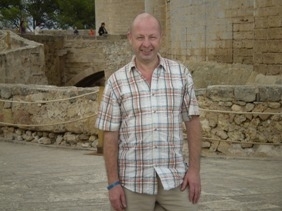 This was taken on a coach day out to the capital, Palma. We had, on the off chance, taken a bus ride round the city and unexpectedly ended up looking over the city from the old fortress (which until then we did not know existed). This surprise helped make this a lovely and refreshing day. But anyway, a warm welcome to YOU to my web pages. I am very much enjoying the journey and the path the web pages are taking me - I feel that they are evolving in a very nice way and direction. My wish is that, during your time here, you find something useful within these pages. Something that might touch you. Something that might help or assist you in your life. Something that might help trigger something in you. A little insight here or a few words there can make all the difference to our journey through life. In July 2008 I was thinking about developing a website to help share my thoughts, feeling, wisdom - if I have any, and experiences. What you see before you are my results to date. I hope you enjoy them and get something from them. As the year 2016 nears an end, being able to share a little of my thoughts on life and my experiences continues to be a very fulfilling experience for me. I've always liked to meet people, talk to people. I've always liked to observe life and try to get the most out of life, and myself. And for some long time I've wanted to write about and share my experiences of life. I feel very fortunate in my life and my experience of life. I can count many blessings during my life. I very much feel that I'd like to give something back - and I hope that these web pages will provide not just information, but also some meaning and purpose to all who read them. I hope by sharing a little of my own experience I might be able to help you in your life. May I wish you all well on your own journeys through life. And hope to see you here again soon. 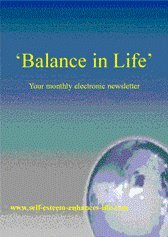 PS	My aim is to create a balanced view of life and how we all can get the most out of it. Please use the Contact Me page to provide feedback. PPS	I feel very fortunate to have found SBI! (Solo Build It!). They have helped me by providing the knowledge, experience and resources to build this website (and sites for many other people). Anybody, with or without previous experience is able to build their own website. I know YOU could if you wanted to. We provide the content, enthusiasm and the 'leg work' to create our very own site. Believe me anyone with a passion for their subject can build a website with SBI!